Our annual Research Prizes recognise the achievements of the rising stars in cancer research and celebrate the researchers who have shown outstanding dedication to beating cancer. 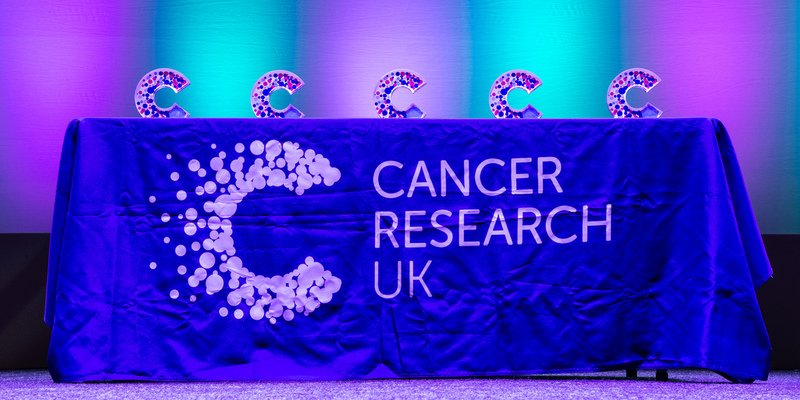 In November, we returned to the NCRI Conference in Glasgow to award our prizes for the ninth year. The Future Leaders in Cancer Research Prize recognises researchers who have produced research of international importance within 10 years of receiving their doctorate, and proved themselves capable of becoming leaders. This year we've awarded three prizes. Dr Sarah Bohndiek is a biomedical physicist who has made outstanding contributions to cancer molecular imaging. Sarah uses a unique combination of modelling, innovative instrument design, and translational research methods in her research, with impact both in the lab and the clinic. Her team have applied the novel techniques to reveal new insights into tumour metabolism and microenvironment, and have also developed them into technologies which are now in clinical trials. Our panel noted her interdisciplinary approach to early cancer detection, as well as her collaborative efforts in establishing the Early Detection Programme at the CRUK Cambridge Centre. Sarah is a Reader in Biomedical Physics at the University of Cambridge and a group leader at the CRUK Cambridge Institute. She completed her PhD in radiation physics at UCL in 2008, followed by postdocs with Kevin Brindle at CRUK Cambridge Institute and Sam Gambhir at Stanford University. Dr Vivian Li is a cell and developmental biologist looking at how stem cells are programmed to maintain a healthy organ, and what goes wrong when cancer develops. Her ambitious programme aims to grow replacement human gut tissue in the lab for use in drug testing and potentially in organ transplants. Our panel commended Vivian’s pioneering work in state-of-the-art organoid technology, which has resulted in numerous high-calibre collaborations, and recognised her significant contributions to the molecular understanding of intestinal stem cells and cancer. Of particular note is her recent success identifying a novel Wnt-activating mechanism of APC-mutated colon cancer as a tumour-specific drug target. Vivian joined the Francis Crick Institute as group leader in 2013. She received her PhD in pathology from the University of Hong Kong in 2008, followed by a postdoc with Hans Clevers at the Hubrecht Institute in the Netherlands. Dr Jamie Brown is a behavioural researcher working on cancer prevention, with a focus on helping people to stop smoking. Our panel highlighted his highly substantial and impactful research on electronic cigarettes and tobacco harm reduction, as well as his research on digital technologies for smoking cessation. They also noted Jamie’s strong engagement with policy makers, the public and the media. Jamie is a chartered psychologist and Senior Research Fellow of the Society for the Study of Addiction, as well as Deputy Director of the UCL Tobacco and Alcohol Research Group. He is also a co-author of “Theory of Addiction” and “ABC of Behaviour Change Theories”. Jamie received his PhD in experimental psychology from the University of Cambridge in 2010, before joining UCL. The Jane Wardle Prize celebrates researchers who have produced world-leading research which advances the prevention or early diagnosis of cancer. This year the prize is awarded to Rebecca Fitzgerald, Professor of Cancer Prevention at the University of Cambridge, MRC Programme Leader at the MRC Cancer Unit, and Honorary Consultant in Gastroenterology and General Medicine at Addenbrooke’s Hospital, Cambridge. Our panel recognised Rebecca for her work in improving the early detection of oesophageal cancer, and in particular, developing the ‘Cytosponge’ tool for early diagnosis of Barrett’s oesophagus. With Cytosponge currently in testing in GP practices, the panel agreed that Rebecca’s unique contributions have had significant impact on the field and in the clinic. The panel also highlighted Rebecca’s role as a leader and mentor in developing the community of oesophageal cancer researchers in the UK and worldwide. In our 2014 Research Strategy, we highlighted the fact that, despite great progress in cancer research, oesophageal cancer remains a hard-to-treat cancer which is commonly diagnosed late. Rebecca has helped to unite a community of researchers around this problem, in part through her role as co-organiser of the International Symposium on Oesophageal Cancer. Our Lifetime Achievement in Cancer Research Prize honours a scientist who has demonstrated a lifetime commitment to the fight against cancer, making exceptional advances in the field. This year the prize goes to Professor Stephen West. Steve is an internationally renowned expert on DNA recombination and repair who has made ground-breaking discoveries that reveal the molecular mechanisms of these processes, with profound impact on cancer prevention and therapy. In his prize-winner’s plenary lecture, Steve shared how he identified how faults in these processes lead to cancer, including the discoveries which accelerated our understanding of the role of BRCA2 in inheritable breast, prostate and ovarian cancers. His work showed how BRCA mutations are linked to defective recombination processes, with huge implications for cancer prevention, and this work has underpinned and broadened the clinical potential of PARP inhibitors. Steve has been a prominent leader in this field for the past 30 years. His career began in the 1970s at Newcastle University, where he earned his PhD in biochemistry, before postdoctoral research with Paul Howard-Flanders at Yale University. He returned to the UK in 1985 as one of the founding leaders of the London Research Institute’s Clare Hall Laboratories. He helped shape the scientific direction of Clare Hall and build its position as one of the world’s pre-eminent research laboratories focussing on genome stability, a legacy that has continued since it was incorporated in 2016 into the Francis Crick Institute. In addition to the impact of his research, our panel noted Steve’s commitment to mentorship, with many of his former students and postdocs now running highly successful independent laboratories. We’re sure that you will agree that these activities have made Steve a very worthy winner of the 2018 Cancer Research UK Lifetime Achievement Prize. Congratulations to all of the fantastic winners of this year's prizes! All of our researcher prizes will open again for nominations next month, so now is the time to start thinking about the leaders who have inspired you and the rising stars at your institute who could be CRUK prize winners. Steve West of the Francis Crick Institute has been awarded our lifetime achievement prize. Find out about his career uncovering the mechanisms of DNA repair.